This styled shoot was inspired by abstract art. 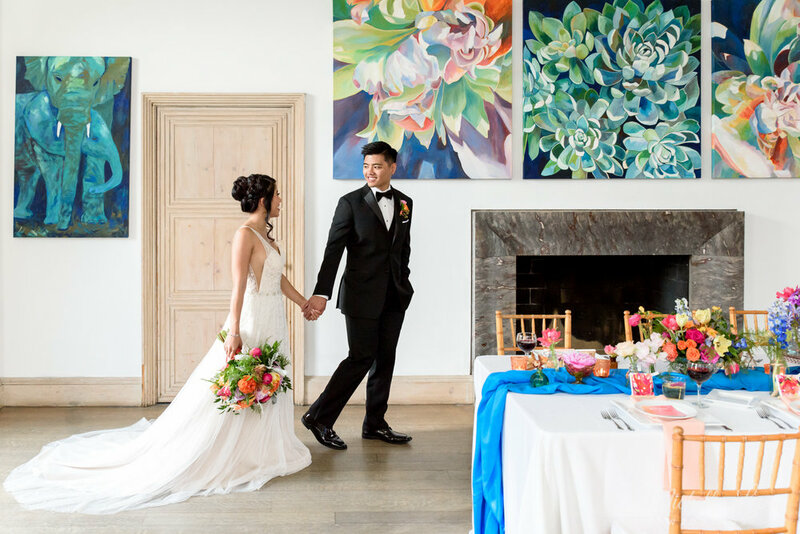 We designed this shoot based on the concept of an art gallery wedding filled with pops of bright, vivid colors found in the paintings and colorful floral arrangements. The art gallery at Alverthorpe Manor in Jenkintown, PA was the perfect location for this shoot. This spring, I photographed a beautiful May Day inspired wedding styled shoot designed by wedding planner and designer Heather Benge at the historic Whitehall estate in Annapolis, Maryland. The pretty grounds of Whitehall were perfect for this romantic shoot with its waterfront views, open fields, and impressive architecture. Earlier this year, I photographed a beautiful styled bridal session designed by wedding planner and designer Heather Benge at the beautiful historic Whitehall estate in Annapolis, Maryland. This elegant styled shoot was inspired by the beauty and romanticism of winter. 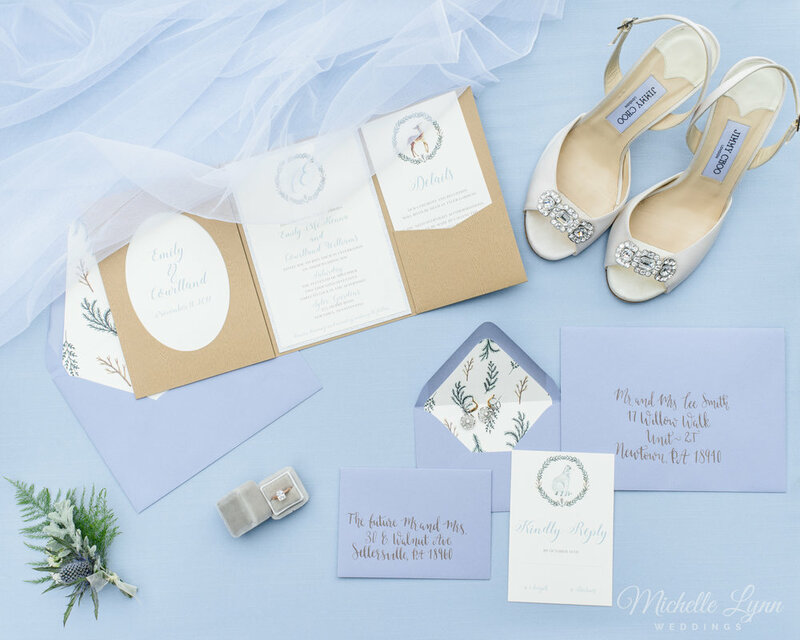 We chose a soft color palette of dusty blue, silver and sage, and incorporated a lot of greenery and an ice motif to evoke a mood reminiscent of winter. Tyler Gardens was the perfect backdrop for the sophisticated and modern style of this shoot. Last month, I photographed a beautifully styled shoot designed by amazing wedding planner and designer Heather Benge of Heather Benge Events at the stunning George Peabody Library in Baltimore, MD. The George Peabody Library provided the perfect romantic backdrop for the elegant and modern style of this wedding inspiration shoot. Our bride Lissa Bergmann wore a beautiful strapless gown, and bridesmaids Katelyn Laremore and Alyssa Smith were styled to perfection in blush and gold gowns provided by Francesca's Bridal. Groom Erik Bergmann complemented the blush and gold color scheme with a blue suit and brown leather shoes. The talented hair and makeup artists of Behind the Veil did an amazing job on the girls with a nice variety of hairstyles speckled with flowers and beautifully done makeup. J Starr's Flower Barn really tied the different parts of this shoot together with a stunning floral alter, a floral table arch and gorgeous bouquets made completely of locally grown flowers from Clear Ridge Nursery, Honeybee Flower Farm and Seaberry Farm. By incorporating the floral and metallic elements of this shoot, The Cake Studio made one of the most impressive cakes I have ever seen. The four tier cake featured contrasting textures, a metallic pop, and a fresh floral look of handmade fondant flowers. Check out some of my favorite photos from the shoot in the gallery below!